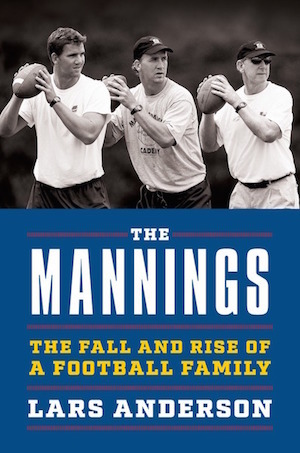 The following is an excerpt from "The Mannings: The Fall and Rise of a Football Family," by Lars Anderson, to be published on August 23, 2016. Order your copy here. They were alone together, the father and his son, cruising along Highway 3 through the Mississippi countryside. In early August of 1969, Archie Manning had just finished a summer-school session at Ole Miss and his father, Buddy, picked him up to come home. Archie planned to spend about two weeks back home in Drew, Miss., before returning to Oxford for the start of fall practice. What a pair they were, blazing through the backwoods on this summer afternoon. The father appeared so happy for his son, and for good reason. With each passing week of Archie’s sophomore year, the frontiers of what was possible had expanded for Archie. What was unthinkable one week—setting, for instance, a school record for most yards in a game—became thinkable the next. On the field Archie had displayed long, sustained moments of grace, the kind that had never before been seen on the football fields in the Magnolia State. This caused Archie’s popularity to spread across the South as if he were being blown by the wind. Yet he retained the small-town values of humility and gratitude that Buddy had taught him, and that filled Buddy with even more pride. Buddy didn’t tell his son that he loved him—it wasn’t in his makeup to reveal the bedrock of his emotions—but Archie understood that his dad was his second-biggest fan, just behind his mom, who had attended every game in every sport that he had played since Archie could throw a ball. Buddy, at 5’ 6”, had been a standout offensive lineman at Drew High when he was a teenager, and now he was in awe of the athleticism of his son. He never imagined his boy would become the Ole Miss starting quarterback, much less an emerging folk hero. But Buddy wasn’t just proud of Archie’s growing football achievements; he reveled in knowing that Archie was making his own way in the world, narrating his own compelling story, maturing into a man of substance. Archie was on the path to a college degree, and that was Buddy’s top goal for his son. There were storm clouds gathering in Buddy’s eyes that Archie couldn’t see—that no one could see. Buddy was a workaholic; he had rarely seen the opening minutes of Archie’s high school games because Buddy felt obligated to stay late at the shop. Buddy’s job as manager of the farm machinery dealership in Drew had always seemed his top priority. After Archie left home for school, Buddy’s business deteriorated. More than ever, Buddy worried that he couldn’t collect overdue payments for the farm equipment he loaned out. His customers—many of whom were his friends—weren’t paying their bills, which in turn made it hard for Buddy to cover his family’s expenses. Buddy just didn’t have it in him to press his friends for payments, because he saw that the entire farming community in Drew was struggling. He didn’t want to play the role of the bill collector and keep food from family dining tables. Buddy also wasn’t feeling well. The stroke of five years earlier had robbed him of much of his strength. Buddy never believed in doctors—he refused to go to the hospital until five days after his stroke—and so he had no interest in seeking medical treatment now. He didn’t suffer any slurred speech from the stroke and he could walk without a hitch, but the family noticed that Buddy seemed a few beats slower, his movements more labored. He was only 59, but he was a worn-down 59. The internal fire that once flamed his passion for life—he loved to read poetry and was something of a biblical scholar—had been reduced to a few fading embers. But even after the stroke, even with the stresses of his job mounting, Buddy almost always showed up (eventually) at Archie’s high school football games. Though before the games he’d tell his son, “I don’t know if I’ll be able to make it tonight,” Archie would look up in the third quarter and see his dad standing by himself, away from the crowd, his eyes locked onto his son’s every move. Archie, immediately, would feel relieved, as if somehow everything would be O.K. now that his dad was at the stadium. Buddy never wanted to show favoritism to Archie over his older sister, Pam, so he rarely congratulated his boy on his athletic accomplishments. Archie understood that his dad was only protecting Pam, and he never questioned his father about his reticence. Archie inherited his dad’s low-key personality—their emotions rarely swung too high or too low—and they usually avoided discussing their feelings. But the time away from home had made Archie more appreciative of his father. He valued how Buddy played with him when he was a boy, that he taught him the fundamentals of football, basketball and baseball. Looking back, he savored how Buddy would sit with him and listen to those Ole Miss games during his childhood. Buddy was the reason Archie loved sports, and now, driving from Oxford to Drew on this summer afternoon, the two enjoyed a nice father-son moment as they talked of old games and old times. Buddy appeared to be happy. That night, after returning to Drew, Archie, Buddy, and Archie’s mother, Sis, drove to nearby Indianola, Miss., for an Ole Miss alumni gathering. The keynote speaker was Billy Mustin, a Rebels football coach and former player. Mustin knew Archie well; he and his wife oversaw the football dorm on the Ole Miss campus. After his speech, Mustin walked over to the table where the Mannings were seated. Looking at Archie and speaking loudly enough for his parents to hear, Mustin said, “I hope my son grows up to be like you.” But Buddy didn’t react; his face remained expressionless. It was odd, Archie later thought, that his dad wasn’t moved by that comment. The next morning, on Aug. 16, 1969, a hard wind stirred the cotton in the Mississippi Delta. Hurricane Camille, a category-five storm with winds that reached 185 mph, churned through the Gulf of Mexico and approached the Mississippi shoreline. In the coming hours Camille would rip apart much of the Magnolia State, leaving death and destruction in its wake. More than 150 people in Mississippi alone would lose their lives to Camille, and century-old towns would be wiped from the landscape. Buddy had recently had a will drawn up. He had seen death creeping toward his older sister, who had been an invalid for several years. He witnessed the burden she had become to her family, how she was now a shell of what she had been. Nothing in life terrified Buddy more than the thought of becoming like her. But on this late morning he appeared to be in fine spirits. Archie left his mother and sister at the reception and drove home alone, eager to spend time and have a steak with his dad. He walked into their little wooden house on Third Street and turned down the hallway toward the first-floor bathroom beyond his parents’ bedroom. Out of the corner of his eye, Archie noticed his father lying on his bed, his legs hanging over the end, his feet on the floor. Archie kept moving toward the bathroom, taking several steps. But something didn’t seem right. It was so quiet in the house—too quiet. Deathly quiet. First he saw the shotgun on the floor. Then the stick that was used to leverage and activate the trigger. The images registered like a series of still frames, ones that would be burned into Archie’s mind for the rest of his life. He lifted his eyes to the bed and—oh dear God, no—there was a big blood spot on his chest. Buddy’s face was up, eyes closed, mouth open. He was perfectly still. Blood was spreading out beneath his body. Then, with his beloved father motionless on the bed from the self-inflicted gunshot, Archie began cleaning the room, working against the clock. He knew Sis and Pam would be home soon, so he needed to act fast. In the Delta, this was a son’s duty—to spare his mamma and sister as much trauma as he could. Tears streamed down his cheeks as he mopped up the blood that was splattered across the room. Even before the doctor arrived, Archie stood over his father’s body and cleaned him up as best he could. As emotionally crippling as this was, Archie believed that his father had planned it this way, for his boy to find him before his wife and daughter could lay eyes on his lifeless body. So Archie took it as his responsibility to prevent Sis and Pam from witnessing this horror, this bloody end that his father had scripted. Archie talked to the police. He watched as his father’s body was carried out of his bedroom and placed into the back of an ambulance. He then burned Buddy’s mattress and the bedroom linens. In the summer of 1969 Archie was 20 years old. Now, in a matter of minutes, he was forced to become a man. Now every major decision that would be made in the Manning household from this day forward would involve Archie. Except one: the son’s desire to quit playing football. Down in Gulfport, Miss., the waves from Camille continued to batter the shoreline. A barge that was ripped loose from its moorings washed ashore. On the hull there were two words that stretched 25 feet. Whoever wrote them didn’t know of the searing pain that now seized Archie, but the author made clear his feelings about the quarterback from Drew. The words read: ARCHIE BABY! One hundred and thirty miles away from Drew in Philadelphia, Miss., the family of Olivia Williams, Archie’s girlfriend, was preparing for the hurricane when the phone rang. Outside a hard rain continued to fall from the foreboding Southern sky when Louie Campbell, Buddy’s good friend whom Archie had called earlier in the day in a panic, broke the news: Buddy was gone. Olivia was devastated, plain heartbroken for her boyfriend. Buddy had left instructions about where to find his important papers, such as his will. But he didn’t leave a note explaining his final decision. Archie would never precisely know why his father chose to end his life—the question would dog him for decades—but he speculated that his father believed that his health was eroding and he feared he would soon become a strain on his loved ones. Olivia and her family drove to Drew for the funeral. After laying Buddy to rest, Archie, Sis, and Pam hosted a lunch at the Manning’s home. Archie rose to his feet and delivered a few words, blinking back the tears and staying composed while expressing what his dad meant to him. Looking at Archie as he spoke, Olivia was in awe of her boyfriend’s strength. He was so eloquent as he opened his heart and let his feelings pour forth. But later, once he was alone with his girlfriend, Archie’s emotional walls finally crumbled. He felt like his soul had been ripped out of him. It hurt Archie that his dad never told him he loved him, and now Archie would never hear those three tender words flow from his dad’s lips. The tears dripped out as he explained how his dad would never get to see him play another football game. Archie believed with all his heart that he was about to be the architect of a special season starting in less than a month, that he was finally about to arrive as an athlete, and now his dad wouldn’t get to enjoy any of that. Why now? Archie kept asking. Why now? Archie told Olivia and others that Buddy had worked so hard in his life, and yet he had so little to show for it. It didn’t seem fair. Archie was only a few years away from turning pro. Then he’d be able to ease his family’s financial strain. No, Archie said, life just wasn’t fair. But if Archie ever had kids, he would tell them every day that he loved them. Even if a thousand miles separated him from his kids, he would make sure that they knew they were cherished and adored, the most important of everything in the world to him. They would never wonder about their dad’s love. Archie made a decision: He was going to quit school, return home, and get a job coaching. He would become the man of the house and provide for his mother and sister. This was the way things were done in Drew when fathers passed away. Archie shared his decision with his mother. He told her that his football career was over, and that he was moving back home. Sis reacted sharply: never would she allow that. Never. Archie needed to pursue his own dreams, whatever they may be, and not pick up the pieces of his father’s shattered life. She told Archie he was going to write his own story, and it was going to be grand and sweeping. She wouldn’t hear any more talk of her son dropping out of school. He would return to Ole Miss and fulfill his own destiny. The decision was firm and final. Days later, Archie drove to Oxford. He lost himself in football, burying his grief. Every game he would play like he was trying to prove something. Every game he would run around the field like he was chasing a ghost—and running from a haunted memory. Reprinted by arrangement with Ballantine, an imprint of Random House, a division of Penguin Random House LLC.